“The Trump Administration is forcing women to pay for their bosss religious beliefs. Putin Trump – Google News: Russian Journalist Masha Gessen on Trump & Putin’s Autocracy and Media’s Refusal to Call Out Lies – Democracy Now! Trump’s Non-Sonic Attack on Cuba – The Nation. Russian Journalist Masha Gessen on Trump & Putin’s Autocracy and Media’s Refusal to Call Out Lies – Democracy Now! 11:17 AM 10/5/2017 BERLIN (AP) The heads of three German intelligence agencies say national and international cooperation and information-sharing is ever more critical as threats become more global. The New York Times reported on long-standing tension and a lack of chemistry between Trump and Tillerson, and NBC reported that Vice President Mike Pences intervention was required to keep Tillerson from resigning this past summer.Tillerson released a statement Wednesday morning denying that he was considering resigning his post. The Washington Post reportedthat The already tense relationship between the two headstrong men…has ruptured into what some White House officials call an irreparable breach that will inevitably lead to Tillersons departure. A former senior Trump administration official, Tillerson has no help. No team, no natural allies, and hes not hiring anyone…Theres a kind of death spiral. In a stunning admission of his concerns about Trump, Sen. Bob Corker (R-Tenn.) told C-SPAN, I think Sec. 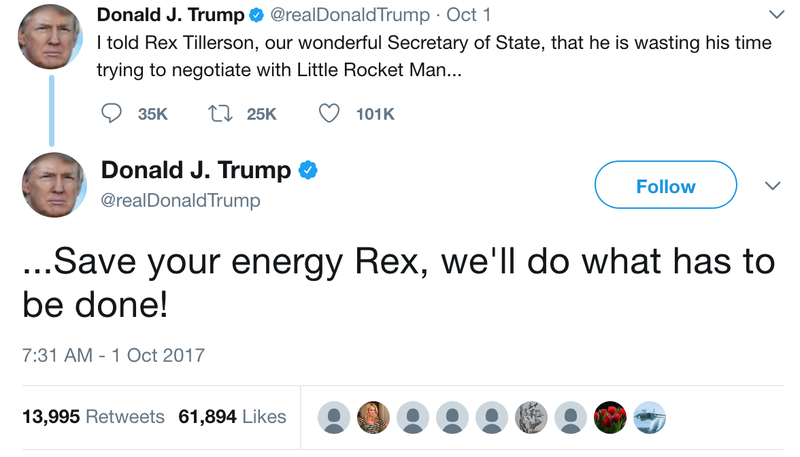 Tillerson, Sec. Mattis and Chief of Staff Kelly are those people that help separate our country from chaos, and I support them very much. He added, As I watch…very closely on many occasions, [Tillerson] ends up not being supported in a way that I would hope a Sec. of State would be supported. 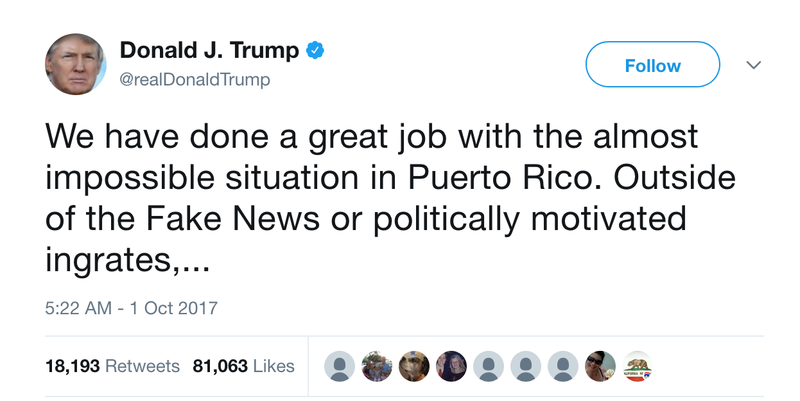 The BBC reported that Trump told Puerto Rican officials on his visit there that they should be “proud” of not losing thousands of lives, like happened in a real catastrophe like Katrina. He added that the island had thrown the U.S. budget a little out of whack. A Reuters/Ipsos poll found that Americans are increasingly confident in the news media and less so in President Donald Trumps administration after Trumps first year in office, during which he said the press was the enemy of the people. A Committee to Protect Journalists official testified before the U.S. Helsinki Commission that declining media freedom in the United States and Europe has emboldened authoritarian governments in Russia and other ex-Soviet states to crack down on independent media and opposition voices. 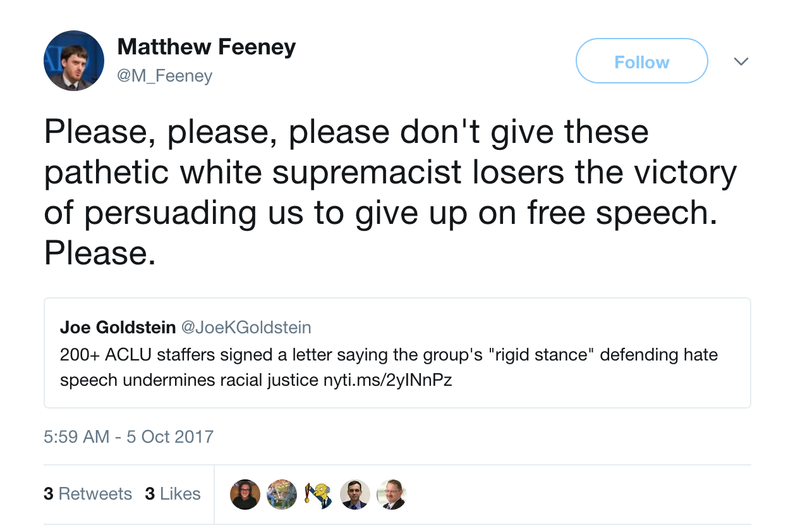 The New York Times reported that a debate has emerged within the American Civil Liberties Union about whether the organization should continue to defend alt-right groups in First Amendment cases. 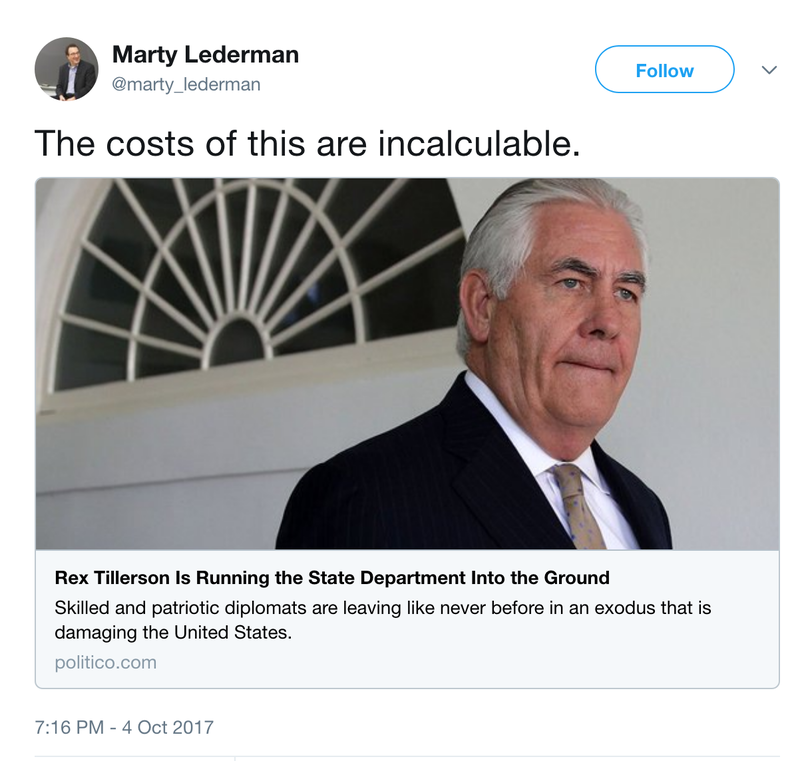 A POLITICO Magazine article noted that under Rex Tillersons watch as Secretary of State, [s]killed and patriotic diplomats are leaving like never before in an exodus that is damaging the United States. The exodus is undermining the institutional strength of the U.S. foreign policy apparatus and its ability to further U.S. interests for decades to come, as well as undermining the Trump administrations ability to achieve its own policy goals. The New York Times reported that HHS Sec. Tom Price resigned because of a scandal involving using government funds to pay for over $400,000 in private charter jets flights. The Times added that Trump told reporters was unhappy with Prices expression of regret, rather than contrition, and his offer to pay only a partial refund to the government. POLITICO reported that Sen. Paul Ryan (R-Wis.) tried to save Prices job by urging White House Chief of Staff John Kelly to reconsider when Kelly courtesy called Ryan Friday morning to inform him that his close friend Price was about to be fired. 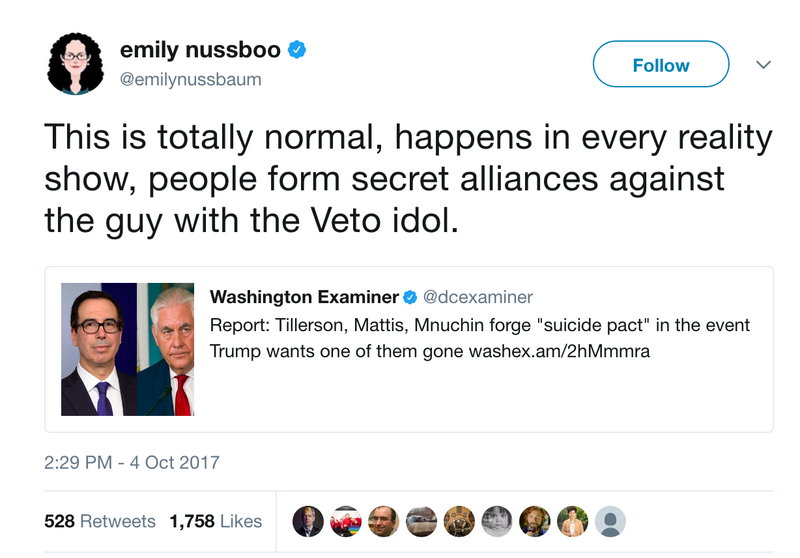 BuzzFeed reported that Tillerson, Secretary of Defense Mattis, and Treasury Secretary Mnuchin, have agreed to a suicide pact, an agreement whereby all three cabinet secretaries vow to leave in the event that the president makes moves against one of them. POLITICO reported Monday that White House officials have begun investigating emails related to a third, previously unreported email account on Jared and Ivanka Trumps private email domain. 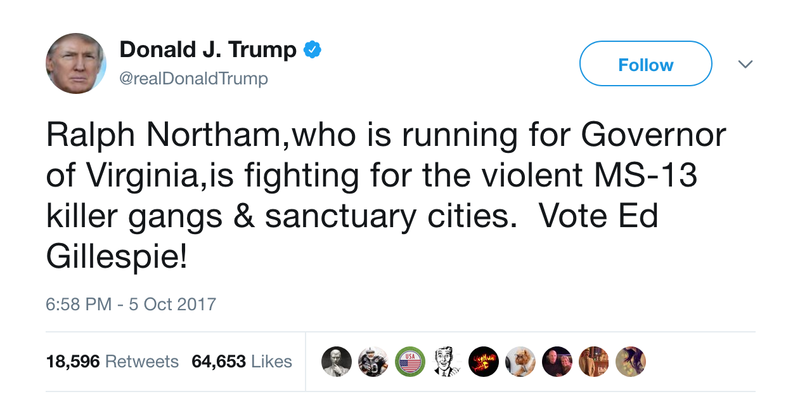 Trump weighed in on the Virginia gubernatorial race on Twitter Thursday, extraordinarily accusing Democratic candidate, Virginia Lt. Gov. Ralph Northam of fighting for violent MS-13 killer gangs, while presenting no evidence for his claim. The Washington Post reported that Trump is planning to decertify that Iran is in compliance with the Iran nuclear agreement next Thursday, and to declare that the deal is not in the U.S. national interest. Trump does not plan to recommend that Congress reimpose pre-agreement nuclear sanctions on Iran. Both Defense Secretary James Mattis and Joint Chiefs of Staff Chairman Gen. Joseph F. Dunford Jr. expressed qualified support for the deal this week during congressional testimony. The Post also reported that the move could start a chain of events that would sharply divide the United States from its closest traditional allies in the world, with a senior official from a European country that is a party to the deal adding, [T]his could push multilateralism to the breaking point. Democratic Senators who met with National Security Advisor H.R. McMaster about the Iran Deal believed that he opposed decertifying it. The meeting was clearly intended for McMaster to get ideas from key Senate Democrats on how to avoid decertifying the Iran deal, which many in both parties think would destabilize relations with allies and make it harder to confront foes well beyond Iran, CNN reported. The AP reported that Trump welcomed Thai Prime Minister Prayuth Chan-ocha, who took power in a coup, to the White House Tuesday. The meeting underscored shifting U.S. foreign policy priorities under Trump, emphasizing American trade and strategic interests over democracy and human rights in the nations it deals with, wrote the APs Matthew Pennington. Oxfam America criticized the Trump administrations response in Puerto Rico as slow and inadequate, and pledged to take the rare step of intervening in U.S. disaster relief efforts there. POLITICO reported that CIA Director Mike Pompeo had turned down a Senate Judiciary Committee request by Sens. Dianne Feinstein (D-Calif.) and Chuck Grassley (R-Iowa) to allow Committee members to view CIA documents related to the Russia investigation. The New Yorker reported that the Manhattan District Attorney Cyrus Vance dropped a potential criminal case against Ivanka and Donald Trump Jr. in 2012, after Trump lawyer Mark Kasowitz donated twenty-five thousand dollars to D.A. Cyrus Vances re-election campaign and met with Vance to offer a settlement. Vance returned the contribution after Kasowitz got involved in the Trump case, and the case was dropped with no conditions weeks after Kasowitzs settlement offer. The magazine added, In September, 2012, within weeks of the case being resolved, Kasowitz contacted Vances campaign about hosting a fund-raiser…He personally donated almost thirty-two thousand dollars to Vances campaign, and twenty of his law firms partners and employees kicked in at least another nine thousand dollars. Then, in October, 2013, as Election Day approached, he hosted a breakfast for Republicans for Cy Vance, which raised an additional nine thousand dollars. NBC News reported that Donald Trump Jr. has participated in a series of paid appearances since his father won the Republican nomination, raising ethical concerns about whether he is benefiting financially from Trumps presidency. Trump Jr. has been paid as much as $100,000 for appearances at U.S. public and private schools and at least one in the UAE. The Washington Post reported that Eli Miller, Steven Mnuchins chief of staff at the Treasury, flew on hedge fund billionaire Nelson Peltzs private jet to Palm Beach, Fla.. The Post called it the latest example of senior Trump administration officials using luxury air travel even though it often raises red flags with ethics officials. The U.S. Office of Special Counsel concluded that UN Ambassador Nikki Haley violated the Hatch Act by endorsing Republican candidate Ralph Norman for Congress in South Carolinas Fifth District. The Hatch Act prohibits federal employees from using their positions to advocate for or against candidates for partisan office. Slate reported that Trump, his key advisers and family members, and many members of his Cabinet have engaged in private use of public funds to varying degrees. 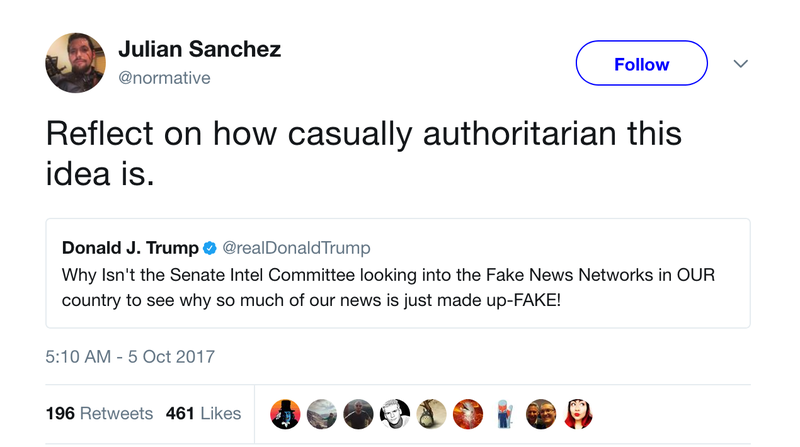 In an article headlined, The Incredible Corrupting White House, Jamelle Bouie noted that the fact that these instances of corruption arent uniformly egregious, however, doesnt mean they arent significant…And while its tempting to say these are ultimately minor concernspocketing taxpayer dollars is nothing compared with provoking a confrontation with a nuclear-capable, isolated dictatorshipthe truth is that they matter as much as Trumps worst offenses. POLITICO reported that VP Mike Pences Chief of Staff, Nick Ayers, criticized Congressional Republican leaders at a closed-door meeting with wealthy donors, and called for a purge if Republicans of all stripes fail to unite behind Trumps agenda. In an interview with Vice News, Rep. Paul Gosar (R-Ariz.) pushed a conspiracy theory when he suggested that the white supremacist rally in Charlottesville, Va. may have been a false flag operation staged by left-wing individuals backed by George Soros. He added that Soros is a Hungarian Jew who turned his own people to the Nazis. GOSAR: Well, isnt that interesting. Maybe that was created by the Left. GOSAR: Because lets look at the person that actually started the rally. Its come to our attention that this is a person from Occupy Wall Street that was an Obama sympathizer. So, wait a minute, be careful where you start taking these people to. And look at the background. You know, you know George Soros is one of those people that actually helps back these individuals. Who is he? I think hes from Hungary. I think he was Jewish. And I think he turned in his own people to the Nazis. Better be careful where we go with those. In most cases, once the original ads were placed, no money changed hands as the bad seeds were broadcast across the land.Americans did it willingly, eagerly, for no reason other than to seem to be fonts of forbidden knowledge and inside information. President Donald Trump joked Friday afternoon at a Hispanic Heritage Month event that Latino leaders in the U.S. are sometimes too tough, honoring the Hispanic community for its contributions to the nation. You teach our children. You lead our churches. Liberals are anxious but fear opposing the powerful, says Hedley TaylorDevorah Baum (The long read, 3 October) refers to the guilt which modern-day liberals feel because they have lost faith in utopian politics and realise they are acting out of self-interest. The guilt, she concludes, is a sign of the gap between the empathy which liberals feel for others suffering and the little they can do to alleviate it. But this personalisation of liberal guilt is in itself a cop-out. It is not so much that liberals feel guilty, since they also experience great anxiety at their reduced status and relative income, but fear that it will only get worse if they take sides against the corporate elite. Liberals and centrists have played an honourable role, with support and pressure from organised working people, in wresting valuable reforms from the capitalist class. But mainly their history is one of cosying up with that class in the interests of preserving the privileges of the middle classes. These days, liberals are most likely to be found defending the actions of people like Clinton and Obama or, in this country, Tony Blair and the liberal social democrats whose pursuit of neoliberal policies has done so much to produce the present broken societies. Donald Trump and Jeremy Corbyn, with their quite different political agendas, have been able to take advantage of the mess they have left. YorkPity centrist dads, says Rhiannon Lucy Cosslett (4 October), having in mind ageing anti-Corbyn Labour party members who cannot come to terms with the world and politics changing. Well, as a centrist grandad and longtime Labour party member, thats not my problem. Rather it is the attitude of Corbyn and his followers to Europe that makes me despair. Crucial stats on the humanitarian crisis are now only available on a Spanish-language Puerto Rican website. Russia’s resurgence what will be Putin’s next move? Comics, including Stephen Colbert, Samantha Bee and Trevor Noah, discussed the Trump-Tillerson tensions, Hurricane Maria relief and fake newsLate-night hosts on Wednesday addressed secretary of state Rex Tillersons press conference, in which he sidestepped reports that he called Donald Trump a moron, and also the ongoing relief efforts in Puerto Rico, which was devastated by Hurricane Maria. Secretary Ryan Zinke is steering the agency badly off course, says Joel Clement, who resigned from Interior on Wednesday.